Update: according to news sources, the eruption DID take place and an ash plume rose to a reported height of about 5 miles (8 km) into the sky. A weather service flight advisory was issued for pilots for an area 20 miles east and west of the volcano and about 50 miles north. As the AVO reports a few minutes ago, "at 4:44 a.m. (AST) this morning, AVO began recording seismic signals interpreted as explosions at the summit of Augustine Volcano that likely mark the onset of an eruption. 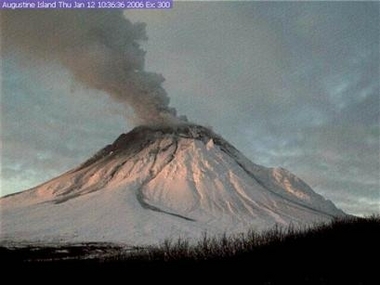 The current activity may be emitting ash, steam, and volcanic gases." The color code for Augustine has been raised to RED. For more details and current information, please visit the Augustine page at the AVO.